A special one - the staircase was finished at 16hr. P.S The music is "Cause We've Ended as Lovers". Written by Stevie Wonder, and played by Jeff Beck. We are getting close - first flight of steps is complete and usable, second flight is half done and will be finished by lunchtime. Just for certain people (you know who you are) a movie. At last we have something that quite definitely is starting to look like the beginnings of a staircase!! Our old staircase was démonté in 2 hours yesterday morning, which is quicker than I would have done it myself (and a lot more scientific - I just know that if I had demolished the second flight a good proportion of the house would have to have been rebuilt). We have kept the old banister and stringer arrangement as a souvenir and future house decoration because it felt plain wrong to destroy such a lovely old thing (oops - am I not appearing totally practical here?). It is made of oak rather than exotique, and it was trop triste to think of it being burnt as firewood. By lunchtime the stringers were (more or less) in place; trying to put something new and straight into something old that isn't straight takes a lot of adjustment and thought. The adjustments and thought that went into putting the stringers in place was as nothing compared to the effort, thought, shifting of positions (both physically and mentally) and finagling involved in getting the noyau in the right place - and then the ever more involved process of making the marches and contremarches fit. Part of the problem is that the landing isn't level so a decision has to be made as to where the stairs actually arrive to. We have decided they should arrive at the highest point, and that at some stage in the future we will lift the floorboards and insert shims to make it level. Or something - maybe "levelish" would be a more realistic aim! 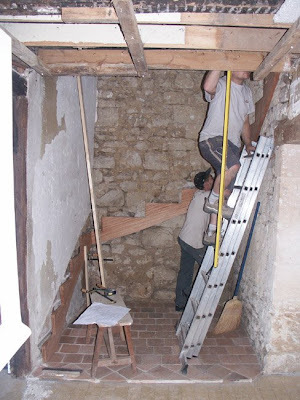 The staircase builders were here until gone 6.00pm, and the team of 3 was supplemented during the afternoon by the boss (M.Chaboisson) and by Jean-Louis (who gave the impression of having stopped by on his way home from work). So this is where things stood at the end of play yesterday. We were assured that they have broken the back of it and things should go smoother and faster today, which so far (they arrived at 8.00) appears to be the case. 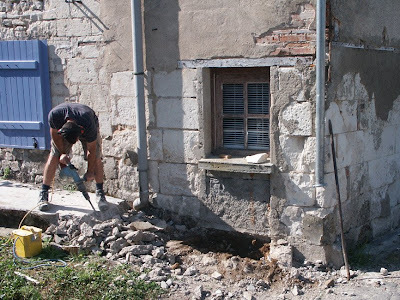 Apparently no-one had told them (until Jean-Louis arrived) that all the steps were 50mm longer than necessary so that they could be cut in-situ to fit the vagaries of our walls. Sitting around while experts push bits of wood around and look slightly concerned is a stressful thing. I kept on getting worried that things weren't going right and everything was going to be an issue and we weren't going to be getting a staircase after all. Luckily, Henri Proust arrived bearing a bottle of Thierry Landry (Chinon) red and distracted us just enough to make it all ok again. Soon we should have a staircase - until then we have a beautiful piece of abstract (or maybe impressionist, on the grounds that it gives the impression of being a staircase) art. 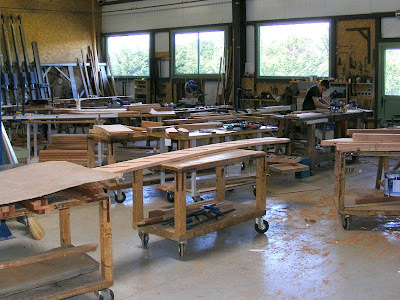 The past two afternoons we have been up to M.Chaboisson's atelier to keep up to date with how our staircase is progressing. Yesterday afternoon when we arrived we were somewhat overcome to see recognisable chunks of staircase being fitted together. 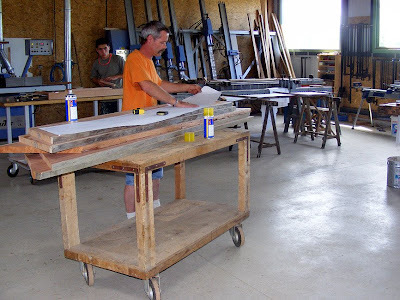 Jean-Louis has completed the noyau and was cutting the rebates into it that the steps will fit into. He was then fitting the steps to check the fit. This is precise work, done by hand with very sharp chisels, so although we took photos, we didn't use the flash: this is why the photos may not be the best quality. 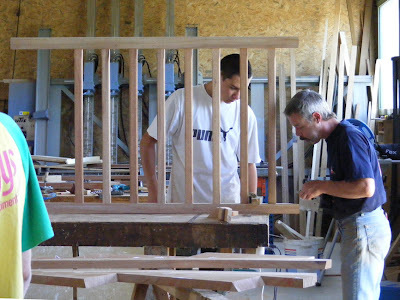 While that was happening, Jean-Michel was assisting one of the younger workers (I assume one of the apprentices) with putting together the handrail that will eventually go on the landing in our attic. Although it will hardly ever been seen, the second flight of stairs is being made with all the same attention to detail as the first flight. We were also pleased to see that our handrails have been formed. These are looking lovely - all graceful curves and flowing lines. 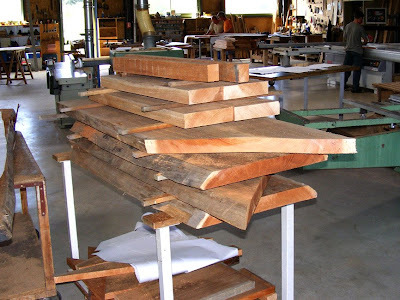 Once all the pices are cut, sanded, and the fitting checked, they will be dismantled and bought to the house to be contructed. I think that's how it goes, anyway - I can't see how they can put it together in the factory and install it in one lump. Then again, I am no expert! When we were leaving we asked the receptionist at the atelier if she knew when the staircase was being installed. She said she thought Thursday or Friday - but no!! She rang this morning at just gone 8.00 to say they will be down immediately to demolish the old staircase this morning..
...and start erecting the new one this afternoon. Wooohoooo! 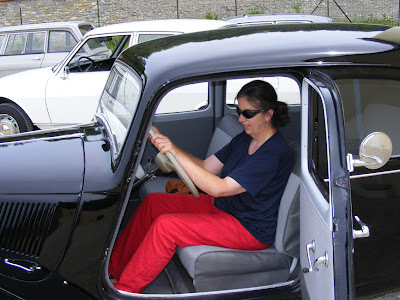 In our search for a Traction Avant we have travelled a fair bit, and seem some stuff. Some of the stuff we even took photos of, and now seems a resonable time to show some of those photos. Our first stop was lunch in a bar in Thoiry. The food was interesting (a whole demi-sel pork hock each - cold- served with frites - very hot) as was the wildlife in the beer garden. 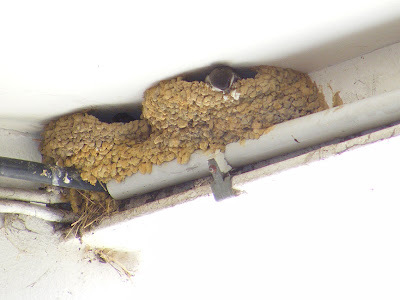 Swallows and House Martins nesting on the same walls, so we managed to take the following two photos without moving from our seats. 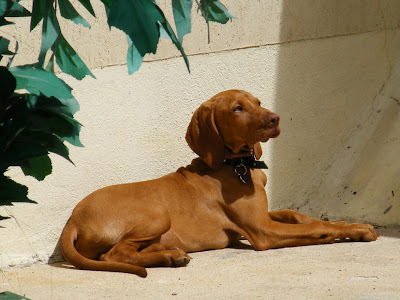 The owner also had a Braque hongrois (Vizsla) puppy of amusing demeanour. it is an African Wildlife Park as well. 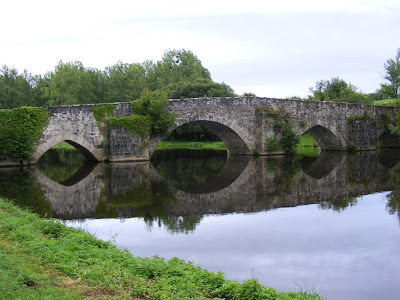 One of the 13th Century bridges in and around Bellac. Looking back, we didn't take all that many photos compared to what we normally manage. Maybe the heat got to us, or maybe it's because we were "on a mission" and concentrating on our destinations rather than the views. We will try do better next time. This allowed us to traipse off and do other stuff besides watering the jardin (see yesterday's post) and has made a major difference to the way our crops have developed. No matter how much you water, 10 minutes of rain is always more effective. And easier, if you're having to cart water up from a stream. I was bemoaning the fact the other day that even though I sowed a second batch of beetroot, chard and carrots in the garden, nothing had happened. At the same time I had put some seeds into pots, and most of them had sprouted within days. Well - now we are all lined up for a glut of beet, because a week after the plants in pots germinated the seeds in the garden have sprouted - every single one of them. Even allowing for losses we are lined up for hundreds of beetroot and chard plants. But still no carrots (although I am semi expecting that today when we check the jardin they too will have come through). The other difference the rain makes is to how much easier digging the garden becomes. Susan was creating a plot for saffron bulbs, and achieved in 10 minutes what last week would have taken her an hour (at least, she says). I was preparing a bed for the veggies I planted in pots, something I gave up as far too hard last week but managed with some style in about 5 minutes this week. The rain has also made a major difference to the orchard, too. Large cracks in the ground had been opening up around the trees, the kind of thing I thought we had left behind us when we left Queensland and perpetual drought, so it was rather nice to see the cracks closing and the return of the rain. 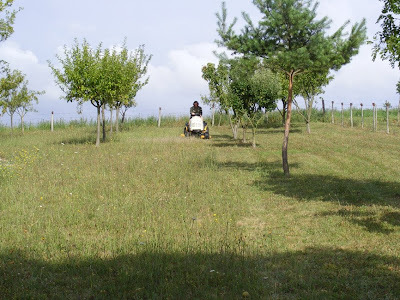 We also had the orchard mowed just before (and during the start of) the rain. We have decided not to buy a ride on mower, but to pay Alex to mow for us. It only takes a couple of hours 3 times a year on a lawn tractor, but buying a mower capable of doing the job (and capable of keeping on doing the job for year after year) would be uneconomical. This is sort of a disappointment to me. I was looking forwards to have my own tractor and playing at famers, but with only half an acre to mow it doesn't make sense. We will be buying a push mower though, so that will be a chance for me to find out if mowing lawns really is the hateful, hot and hard work I remember it being from my childhood. 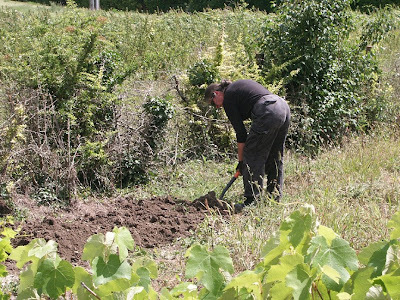 Over the last couple of weeks the blog hasn't exactly been receiving our full attention, which will not come as a surprise to anyone who has restored a house or who owns a large garden/orchard. 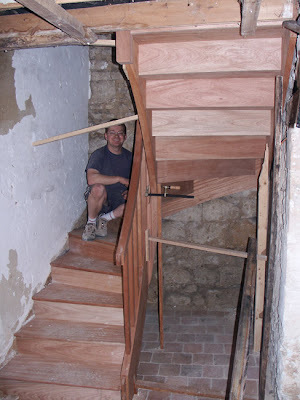 There is a reason - apart from the staircase - for the lack of variety in our blog posts though, and that is Simon's Secret Project. Regular readers will know I occasionally look at cars: old Renaults, Citroens and sometimes more exotic fare. I am not the most mechanically minded of blokes so I admire them as much for form as function - something I suspect even the most hardened engineer does. 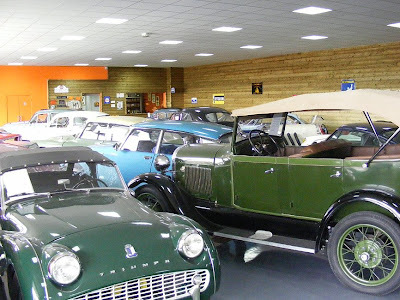 Of course, we all laugh at 2CVs (well - we do if we have any sense of humour), and we all ooh and ahh when we see a vintage Bentley, Hispano Suiza or Bugatti. Some of us are even attracted to some modern cars; the Aston Martin DB9 manages to quicken my pulse, and a Maserati Quattroporte is a thing of beauty. There is one car, however, that appeals to me on a completely different level. It isn't the most luxurious of cars (although it's not bad on that front) nor the most advanced (although it its day it was revolutionary). Nor is it the prettiest (even though is it attractive) or rarest (over 3/4 of a million were built over a period of more than 20 years). I just like it, and I want one. 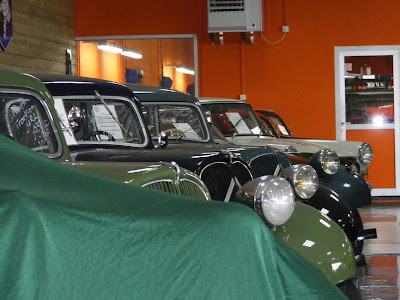 Last Week we have drove over 1000km* to look at Citroen Traction Avants. We have seen some really nice ones but none have been THE car for me. Last Tuesday we drove a pretty black one, but I wasn't convinced by the way the doors fitted. We saw a very nice example on Friday, but it isn't black, it's grey (most post war French Traction Avants were black, but they were made in grey and blue for the Algerian export market) and I want black: baddies and spies drive black Traction Avants. So if anyone has a Citroen Traction 11B, left hand drive, black, in good condition with normal French registration (Carte Grise Normale), drop me a line. Post war malle plate preferably, but a big boot model wouldn't be a problem. (For those not in the know, the difference is shown here). *All this was achieved on not a lot of gazole. Our last tank of fuel got us 1020km, at 4.7235l/100km, 59.8 mpg (UK) or 49.79mpg(US). Not bad for a 10 year old 1.9 diesel. We went up to M.Chaboisson's atelier yesterday morning because Susan and I had a misunderstanding. I thought M.Chaboisson had said the staircase would be finished by the end of July, Susan thought he had said he was off on holidays on the 25th. When we arrived the Maitre himself was there, and he showed us the way work was progressing, and assured us his holidays start the end of July, but he wouldn't be going until he had finished our job. He than said we should return on Monday, when they will be pre-assembling the staircase in the workshop, with the plan of installing it in our house on Tuesday. Or Wednesday. Probably Wednesday, but maybe Tuesday. Probably on Tuesday they will take away the upper section of our old staircase and install on Wednesday. Unless they do both demolishing the old one and installing the new one on Tuesday. Whichever way it goes, it looks like we will be able to climb stairs and use the upstairs rooms by the end of next week. The workshop was really busy yesterday morning - lots of people working hard, lots of staircases waiting to be assembled, with one already having its balustrade attached to the stringer. It has rained a couple of times in the past few days - good, constant rain with not much in the way of destructive heavy stuff. We planted late this year because of when the garden became ours to use. The beans are flowering and about to produce, and we have been picking courgettes for a couple of days. (The expected flood of courgette has not started - yet.) 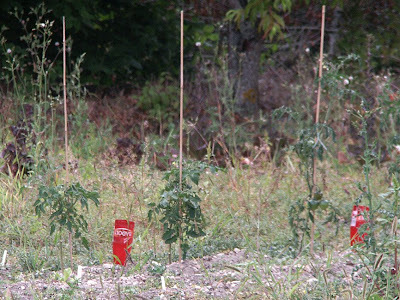 We are starting to pick tomatoes, and the chillies are looking promising. We even have flowers on our aubergine. The seeds we sowed have been a disappointment though: 3 chard, 1 beetroot and about 6 carrots is all we have despite putting in a row of each. Last week I filled in the gaps with more seeds, and still nothing. Obviously something is eating the seeds. To try counter this I am sowing more seeds this week, this time in pots. Because they are root vegetables I am planting (and the fact they are going in at the end of the recommended planting window) I wish to disturb them as little as possible. 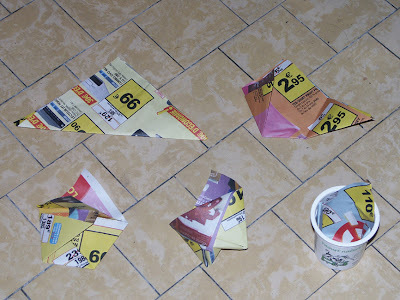 I am planting one seed per pot, and lining the pots with paper so that when the time comes to plant out I can (hopefully) slide out the paper cup complete with plant and stick it straight into the ground. I will be planting beetroot, carrot and chard in youghurt pots and hopefully bypass whatever it is that makes our hoped for plants fail to materialise. We called in on M. Chaboisson yesterday afternoon to check progress. After handshakes all round Jean-Louis showed us the stringers, which have now been routed to take the steps (marchés)* and risers (contra-marchés)*, and pointed out that the apprentice was cutting the handrail blanks. All of our steps have been shaped, (with a natty litle curve and rebate on the underside) which we would have taken photos of except the batteries in the camera went dead. 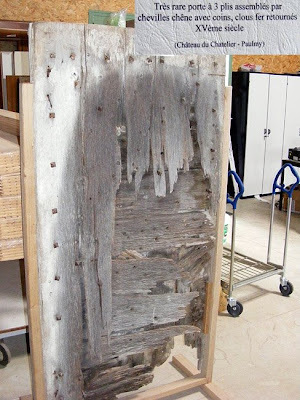 M. Chaboisson has an informal little museum in his atelier, including old doors he has made replacements for, and a collection of old tools. He also made a replica cell for the donjon in Loches, pictures of which are here and here. p.s. Someone we know is having bacon and eggs for breakfast today. 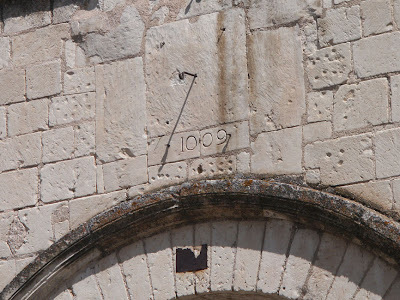 I mentioned last month that our church is 1000 years old this year. Well - here is the proof, although I am not sure that many archeologists would find it a completely convincing argument. 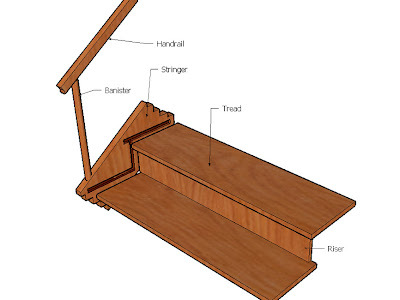 The parts of a staircase. Yesterday afternoon we trekked up to M.Chaboisson's workshop to have a look at the staircase. 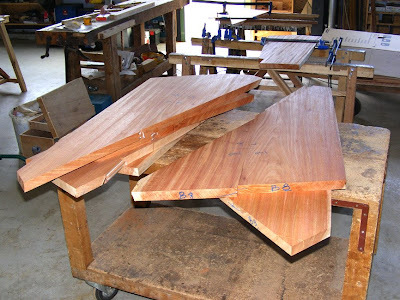 Niangon, in the raw, waiting to be made into balustrades. The wood has arrived, and we now know the staircase will be made from Niangon, a non-floating hardwood from Gabon/Cameroon Tarrietia (or Heritiera) densiflora, which means it is a Sterculiaceae and comes from the same family as Theobroma cacao, the plant responsible for chocolate and cocoa. Jean-Michel was laying out the paper plan to cut the blanks for the stringers, while Jean-Louis was starting work on the noyau*. 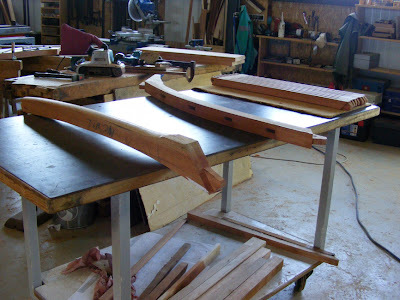 All the blanks for the treads have been made and are awaiting final cutting, and the wood for the banisters and handrails is sitting there waiting for work to begin. The wood for the treads. waiting to be cut down to size. 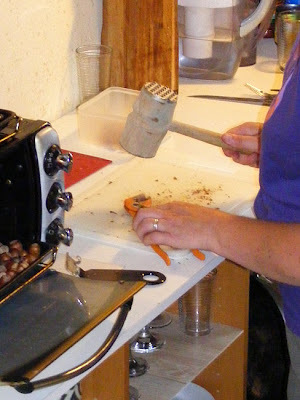 *Until two weeks ago, we thought noyau was walnut wood. There is a separate entry on our devis for noyau because we wanted to have the inside curve of the demolished staircase reproduced in the new staircase. 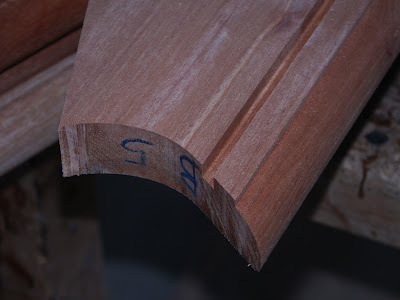 We knew the separate item on our devis was because the curve needs to be carved rather than cut, but we didn't understand why it was to be made from walnut when the rest of the staircase was exotic hardwood. We wondered what the two woods would look like together. We knew what walnut looked like, but we could only guess what our bois exotique would look like because until yesterday we did not know what species it was going to be. Eventually we asked if the menuiserie had samples of the two woods so we could see them together. 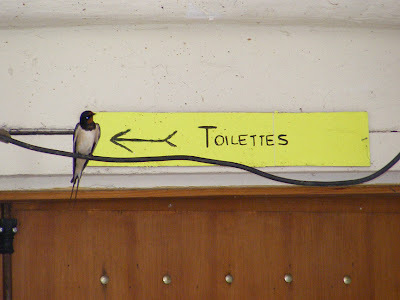 The receptionist looked completely puzzled by this request and said 'But it is the same wood!' For a moment we thought 'Wow! 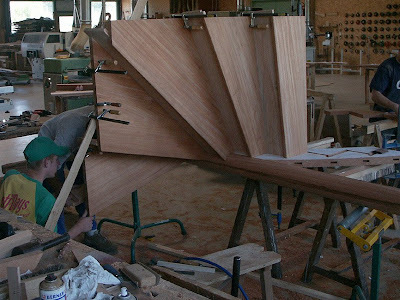 We're going to get a staircase in exotic walnut!' but then it dawned on me...noyau must be a technical joinery term. Noyau must be the name of that section of the staircase...doh! Much laughter all round at the menuiserie, and I'm sure Jean-Louis will do a fine job. Noyau = newel post, but in my defence, I would like to point out that my dictionary was very little help in this matter. I showed the entry to the receptionist at the joiners and she agreed that it wasn't very helpful. It says 'noyau: (nm) stone, kernel, nucleus, cell, hub, core'. Walnut tree in French is noyer, and I guess I just assumed that the wood from walnut trees was called noyau. Save Preuilly's School of Music ! Last night the Ecole had a fund raising dinner. Pierre-Yves says that the Commune is struggling to fully fund the school nowadays, and the dinner needed to raise enough money to save the school. We were planning to go anyway, and Sylvie, Pierre-Yves' wife, made sure I got tickets before they all sold out, and in the process introduced me to Jean-Marc and Valèry, who were the main organisers. They only live a few doors away, but I had never met either before. 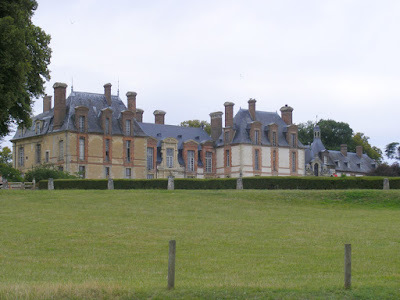 The dinner was to have been held at the Plan d'Eau (Recreation Ground) but on the day it was raining, so the venue changed to the Salle de Fêtes (Community Hall). The catering was done by volunteers – a group of people that I suppose in English would be the Friends of the School of Music. The menu started with a planteur (a deceptively inocuous fruit punch, laced with white rum). The entrée was salade de betteraves (beetroot salad) and salade Niçoise, followed by cuisse de canard confit (slow cooked duck legs), pommes de terre sautées (fried potatoes) and haricots verts (green beans), and then a cheese course of salade verte (green salad) and fromage de chêvre (goat cheese – proper Ste Maure de Touraine too). Dessert was tarte aux pommes (apple tart), followed by café (coffee). All of this cost €22 and there was a choice of wines which diners bought separately. Most people opted for the rosé Touraine gamay 7€, until the cheese course, then switched to vin rouge and champagne for dessert. We sat with Sylvie and Pierre-Yves and were introduced to their friends Brigitte and Antoine. Brigitte was described as 'hot', which has a quite different meaning in French – I'm not sure exactly what the English equivalent is, but Brigitte is very extrovert and tactile, full of jokes and kisses for all. 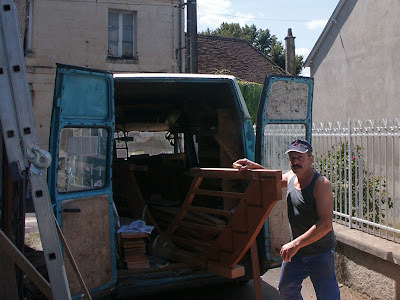 Antoine is a tree surgeon and woodman from Grand Pressigny, so once our fireplace is installed, I imagine we will be contacting him for firewood. On our other side was Olivier and his daughter Jeanne. Olivier is a graphiste (graphic artist) and known to his friends as O or l'Olo. 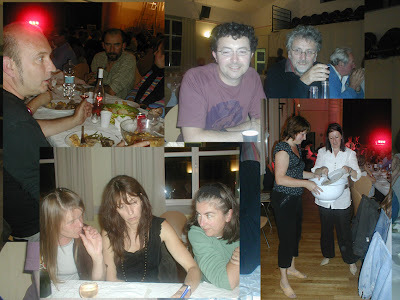 Top left: l'Olo; top right: Pierre-Yves and Simon; bottom right: Sylvie C and another volunteer, clearing plates; bottom left: Brigitte, Sylvie L and me. 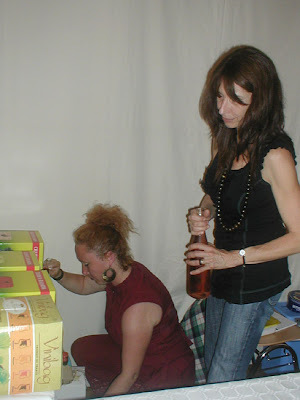 Brigitte and I are discussing champagne, Sylvie is drawing son bébé (ie Pierre-Yves) on the paper tablecloth. 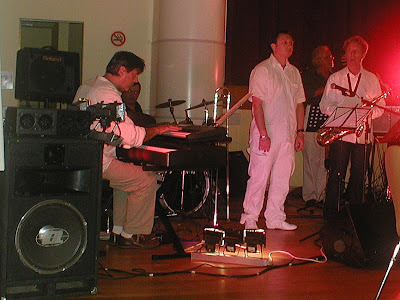 the keyboard player was particularly good. decanted from boxes to bottles for the table. 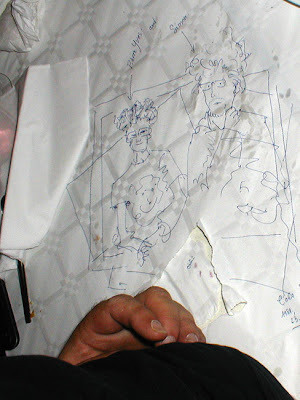 L'Olo's drawing of Pierre-Yves and Simon on the tablecloth. 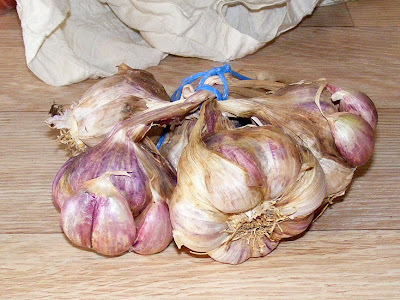 Pistou, the French version of the Italian Pesto, is a Provençal dish, but here I have been playing around with the recipe to produce a tourangelle version with local ingredients. Put all but the cheese and the oil in a food processor and whizz. Add the oil in a thin stream until you get a consistency you like. Mix in the cheese. 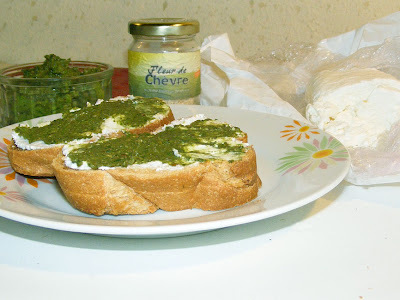 Serve spread on les toasts (croutes or toasted slices of pain or baguette), topped with a slice of fresh goat cheese. One of our local goat cheese producers makes a sort of grated Parmesan equivalent from finely crumbled very aged fromage de chèvre called fleur de chèvre. It's powerful stuff, and when I said to him I was going to substitute it for Parmesan in pesto, his advice was to use less than you would use of Parmesan. He's right. 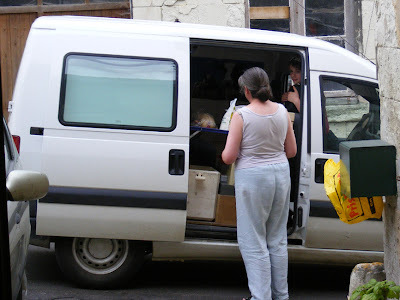 Buying from the travelling laitière. The other goat's cheese, a demi-buche de fromage frais (a half log of fresh cheese ie only a few days old, not aged) is made by a different producer. She calls at the house on Mondays and Fridays and I nearly always buy something. Hazelnuts on the tree in our orchard, not ready to pick yet. 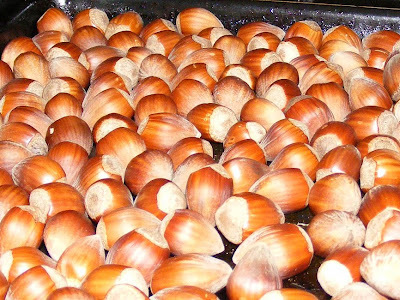 Hazelnuts in the oven, ready to be roasted in their shells. 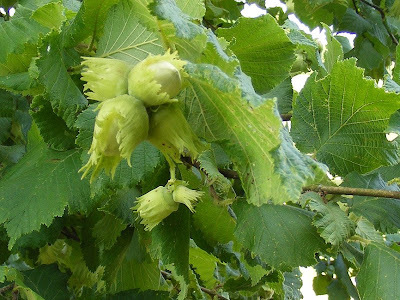 Walnuts and hazelnuts are widely grown in the Touraine, to the point that you do not need to buy them ever, you can just pick them up off the ground in parks and on roadsides. We have several trees of both growing in our orchard. They make a great substitute for pinenuts in pistou. Christian and Martine gave us. If you are in France and don't want to go to the bother of making your own pesto, then the best rapport qualité/prix (value for money) commercial pesto is Casino Délices pesto à la genovese 2.60€ (Casino is a French supermarket chain – both the mini-supermarkets in Preuilly are Casinos). When be bought our house we were intruiged by what "The Concrete Thing" at the back could be. In September 2007 we discovered the manhole cover was over the well, but why the "Thing" extended so far and what its purpose was? No idea! In May last year I made an attempt to break it up, but the tools I had weren't up to the job - even my Electric Destroyer wasn't big enough. Alex has a much bigger Electric Destroyer so we asked him to come over and apply some pressure to the Thing as part of our larger plans for the garden. On Thursday he arrived with a full selection of gear, and even though it was a very hot day, by lunchtime most of the Thing was gone. In the process we discovered the steps down to our back door, which has been converted - quite badly - into a window, and may one day once again be a door if I can figure how the angles will work. After a very nice (90 minutes long, naturally) lunch we took the spoil to the decheterie, tidied up and the job was done. We have left the gully in place to take the rainwater from our downpipe away from the walls, but it appears the whole of the Thing was put in just for that purpose. We have also left that part of the thing that surrounds the well. In the fullness of time it will be removed, but it will have to be done carefully so that bits of old concrete don't fall into the well. 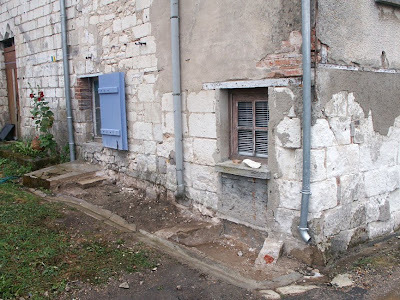 Eventually we will have a "French drain" that runs along the wall to take the water away, and a pipe that attaches to the drainpipe and runs under the garden to emerge at the street. We had wanted to run the rainwater off the roof and into the well, but that isn't allowed (one assumes either to keep the "source" pure, or simply so that when it rains the town's gutters get flushed). We are no closer to understanding quite why the Thing was built in the first place. It was done in two stages, at first just a thin layer of concrete over old stone, but sometime quite recently (within the past 20 years is my guess) it was built up until it dominated the back of the house. You can see that even yesterday the drain worked quite well on its own, and it really did rain quite heavily at times. 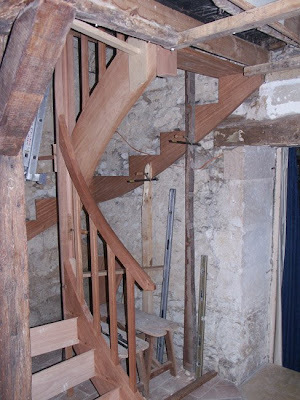 We were planning to visit M.Chaboisson's workshop on Wednesday to view work starting on our staircase. Imagine our surprise, then, when M.Chaboisson arrived at our door on Wednesday morning with his plans, tape measures, and digital angle measuring device. He explained that he had drawn up the plans, looked at how misshapen the space for the staircase appeared and thought "surely not!? ", so he was returning to check the angles again. After comparing the reading from his angle measurer against the plans he was delighted to announce that the original measurements were right after all, and said he would be starting Thursday. 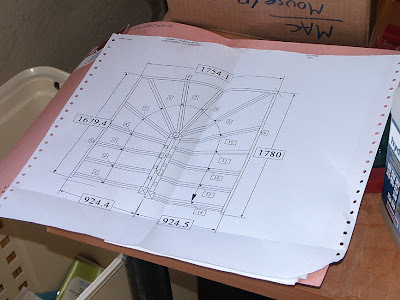 We were therefore somewhat bemused when M.Chaboisson arrived yesterday morning, tape measure and spirit levels in hand, together with the plans for the second flight of stairs. 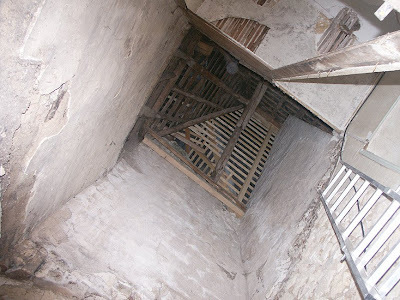 After checking again (which meant climbing the scary rotted away 2nd flight of the old staircase which is still in place) he came down and said his measurement for that level were good too, and work would commence "this afternoon". All these return visits "just to check" would normally have made us quite nervous except for the fact we have seen his staircases in other houses and have been really impressed by them. So at 4 o'clock we went up to the workshop. 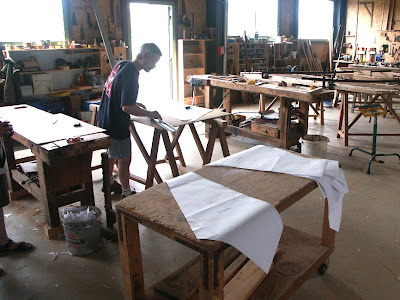 The receptionist was concerned that as work had started just that minute we would be disappointed and did we really want to look, but after assuring her that we wanted to see everything she showed us into the workshop. Although there wasn't much to see, it was exciting to see the full sized paper patterns for the treads being transferred to hardboard, prior to being put on the cutting machine. 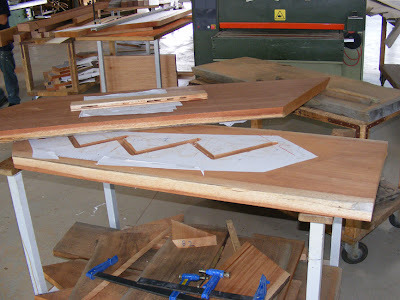 We assume the pieces for the staircase are made on something like a huge key cutter's jig, where one side follows the hardboard pattern, while the other side cuts the "exotic" wood to size. We still don't know what exotic wood we are getting, but it arrives at the workshop later today and we will be able to read what it says on the delivery note. Our next visit to the workshop is on Monday. I can't wait! It rained last night - after a fashion. At about 7.00 it started thundering, so we went out and sat under the eaves in the courtyard and watched huge drops of rain evaporating as they hit the cobbles. It was about 5 minutes before any water started coming out of the downpipes (it really was that hot yesterday afternoon) and then it stopped. There was about 10 little hailstones in there as well, which had us worried for our peaches and nectarines, but they stopped too. There was rumblings and gusty winds at midnight (along with more lightning and thunder) but I don't think there was a great deal of rain with it. At 8.30 this morning it started raining - nice and gently, which means we won't have to water the garden today (hooray!). 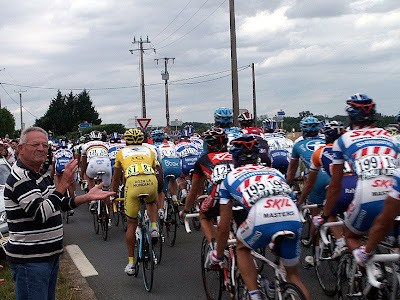 As promised, the Caravan of the Tour de France 2009. 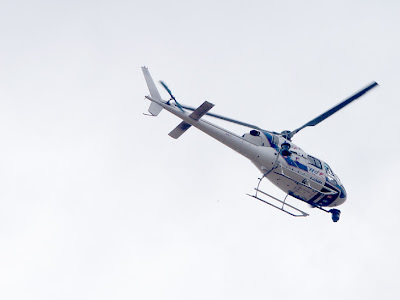 Also, a couple of photos of the helicopter taking the pictures for television. Last year over Preuilly it was a lot higher in the sky, for those authentically beautiful views. 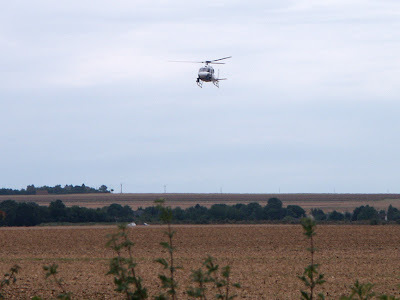 If you were watching television, this is the helicopter filming as the peleton went through the crossroads ar le Relais (about 17km from the finish). We didn't get as many goodies this year - a bag of Haribo licorice is all I scored. Maybe one needs to be in a town so the vehicles are travelling slower as they pass you. 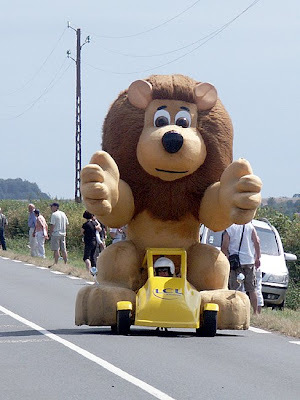 I enjoy the Tour de France so much that I am considering watching it every year. Living in the (almost) centre of France, we should be within a couple of hours drive of the course most years. It will be interesting to see if crowds on non-holiday days are as large as the were on Bastille Day. 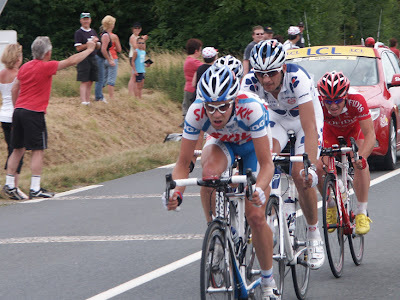 Last year the Tour came through Preuilly sur Claise. 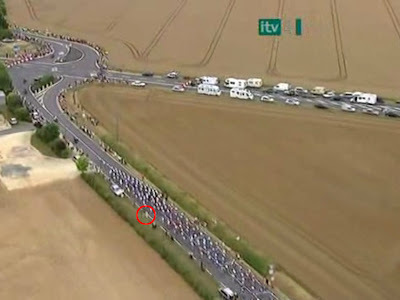 This year the closest it came was near Chateauroux - about 60km away, but as Susan had missed the Tour last year we decided to take a bit of a trip so she could experience it first hand. We drove to a crossroads called le Relais, found a comfortable spot and waited. This short (5 minutes or so) film is what it is like at the Tour de France, from the time when you think you might see some bicyclists until the time it is all over. sitting back in the pack about 2 minutes behind. faces in the crowd, but all I got was bums. 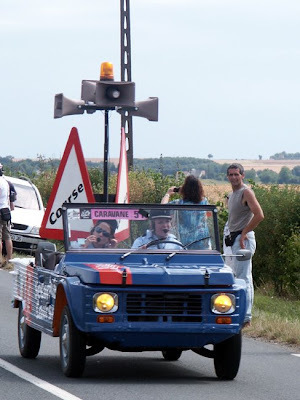 Later in the week we will present the wonders of the Caravanne in living video. You don't often see one of them!